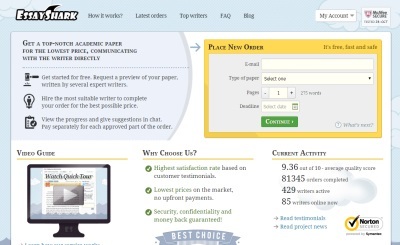 EssayShark.com is relatively new company working in the field of academic writing. It has completely different working principle that all the others and due to that is considered as unique. The first thing noticed at their website is completely different visual appearance. Despite the fact that its modern design is catching attention of web designers, people who need writing assistance can be confused with the organization and content of this website. Clients who are not familiar with the working process of essayshark.com can easily give up from this company since they need to spend some time to find information how essayshark.com works. As it is stated above, working process of essayshark.com is much different from the other similar companies in many ways. First of all, this company does not have clear offer. Every client who need writing help has to place an order and define paper type, deadline, literature and formatting style. After this phase, order goes online and writers working for EssayShark.com bid and give an estimation of costs. During this phase client have possibility to review writers’ background and choose several on them who meet demands. After that, clients are able to establish contact with selected writers and ask for paper review. The last phase of the selection process is when clients make final decision and choose writer according to the paper review. After that, clients and writer can start their collaboration. Even though this company works on the principle of bidding, it would be good if company could create a chart or presentation of the papers they can cover. Clients who want to use their service for the first time do not have any idea what paper types can be provided by this company, neither have any information about the services this company covers. In addition, this company does not have any samples so it is not clear how what are capabilities of this company. As it is explained in previous text, this company does not have clear pricing table. Everything is on writers who bid on every order and estimate costs for the requested work. Essayshark.com says it is one of the cheapest services available online, but after analysis of their writers’ rates, it is not so obvious. Above all, this company does not have money back guaranty. Clients do not have to pay in advance, but after the paper is delivered. Clients have possibility for unlimited amendments, but once they pay the paper, they cannot request money refund. At this moment, this company does not have any type of discount on their website. They claim that they provide discounts via social networks, so clients who would like to save some money should follow them. This company does not have typical customer support. They do not have online chat. Taking into consideration that their working principle is much different from processes of other writing companies, it is obvious that many clients would need this type of contact with company representatives. The only good thing about this company is the fact that clients can create better communication with chosen writers.